Pffffff…… Jake called 2 hours ago and didn’t hear it again.. Well it’s OK, he ‘ll understand.. This time Jake won’t understand. Not seeing your smartphone is unfortunately a thing of the past my lady friends. Put the blame on Ringly. Ringly is probably one of the first (if not the first) smart jewellery designed specifically for women. As the names suggests, it is a beautiful woman’s ring that is connected with your smart device either smartphone or tablet notifying you for incoming calls, messages or emails. Cool idea but how does it work? You are in the middle of a very important meeting. You want to be discreet and left your phone in your purse. However, you are waiting for a very important phone call. At least that’s what you said in the meeting. It’s really about your mum’s apple pie that you need to pick up on your way home. While you have the meeting your phone starts vibrating but you don’t hear a thing. You start feeling the ring on your finger buzzing. You know that it is probably your mum. However, you check the Ringly and this is the type of color and vibration that you set for email notifications. False alarm… You then remember that through the Ringly app, you have the possibility of setting custom color and vibration patterns for different types of notifications. Sounds great but how does it look? What if I don’t like the design? Good news.. You have four different stone combinations by choosing among Stargaze – Black Onyx, Wine Bar – Pink Sapphire, Into the Woods – Emerald, Daydream – Rainbow Moonstone. 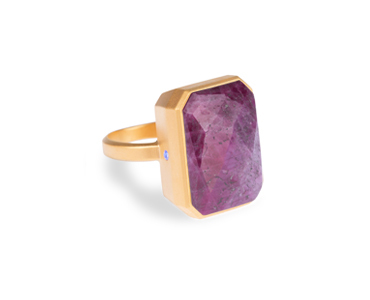 Ringly is carefully crafted with semi-precious and precious gemstones set in an 18 carat gold plated brass setting together with a small gemstone on the side of the ring which flashes when new notification is received. Alright, gimme that ring but no need for the box, thanks! The accompanying ring box is the actual charging station. You simply place your Ringly inside the box in order to charge the battery. The battery lasts a bit more than two days depending always of the usage and you have the possibility of monitoring the battery status via the Ringly app. First orders are scheduled to be shipped during Fall 2014. The Ringly is priced at $145 and $180 depending on the stone which is 25% off for preorders.